While a good gaming experience depends mostly on the game itself, it's also important to have a nice seat and posture to keep you going for some hours. PC gamers have had nice gaming chairs for years now, allowing them to enjoy a great gaming experience. However, these chairs are meant for PC gamers as without a desk, they're practically useless for for example console gamers. They resort to their sofa or bed, but this isn't always the most satisfying solution. Gamewarez is relatively new company that designs gaming beanbags for console gamers to provide them with an ultimate relaxed feeling. Let's see what we think about the first review sample we received from Gamewarez. Our first impressions of the beanbag were positive. The material used for the beanbag's exterior is very robust and from high quality. It looks very modern and uses typical color schemes for gaming. We reviewed the crimson thunder version which has a black skin with red seams. The seams are accurately finished and will last for a long time. For the time that we used the beanbag, we did not see any sign of wear. My clumsiness made me realize that the exterior is repelling fluids quite well. It is however pretty vulnerable to dust, but this shouldn't be a problem if you clean your room once a while. Moving the seat is very easy as it only weighs 4.5kg. The beanbag is also designed to be used inside and outside your house. Unlike many other beanbags, you sit quite high above ground and you keep a good posture for gaming. I know some beanbags where standing back up is a real challenge, that's different with this one. Overall the beanbag sits pretty good and is very spacious, but for bigger people with a need to lay their head against the back from time to time, this might be a little tricky as the backrest isn't very high. However, I had no issues there, you can easily sit a little lower whenever you want. The filling stays in place quite well, when you accidentely deform it, it's very easy to get it back to normal in a matter of seconds. You even have the possibility to add filling to the beanbag using the zipper on the bottom. WATCH OUT! Only refill the beanbag when absolutely needed, because when you open this zipper just out of curiosity you will regret it. Some other features like the resizable side pockets and headset holder can come in handy so you don't have to stand up for things like getting the remote, your controller, drinks or you headset. 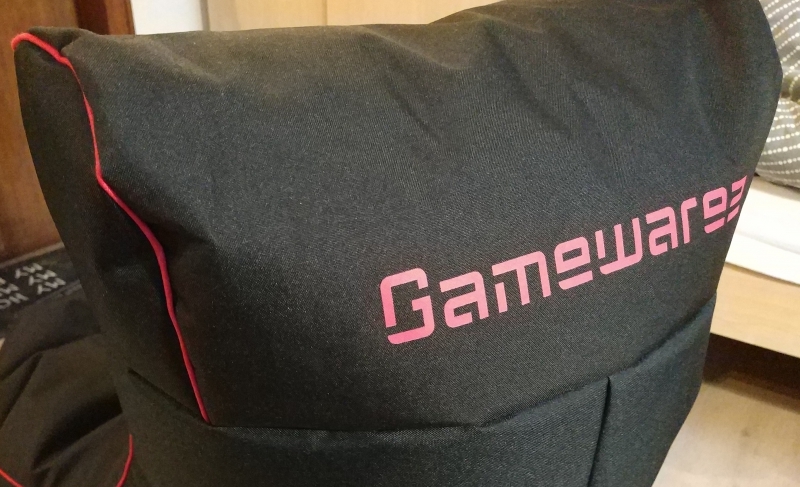 Gamewarez was able to create a great beanbag for gaming purposes as you can read in the above. However, all of this comes with quite a price tag. With a whopping 130 euro pricetag, this can hardly be called a bargain as there are a lot of other beanbags sold for half the price. What you do have to understand though is that this beanbag is very durable and does assure comfort and lasting quality. Most beanbags on the market wear out pretty quick, this mostly because of the cheap filling that loses its volume over time. The materials used in this product are from exceptionally high quality in comparison to other beanbags, however is that still worth the price? That depends on the customer; we'd say that this might be the biggest turn off for most buyers. Gamewarez's classic gaming beanbag is certainly an achiever in its purpose. High quality materials and a thought out and modern design are the key ingredients for Gamewarez's comfortable and very durable seat giving console gamers a real relaxed gaming experience. You should be aware that the backrest isn't very high and isn't suited for very tall people who like to give their neck a rest once a while. This particular problem isn't a very large dealbreaker as for most people it'll be okay to reposition yourself in the beanbag to gain more backspace. Like with all good products, this beautiful craftsmanship comes with quite a pricetag. For 130 euro you easily pay double the price of a normal beanbag, making this product an option for more serious gamers or customers with specific wishes. Nevertheless we approve the great quality and comfort of this product and support the young company in their future endeavours. A well earned Silver Award for the Gamewarez Classic Series Gaming Beanbags.